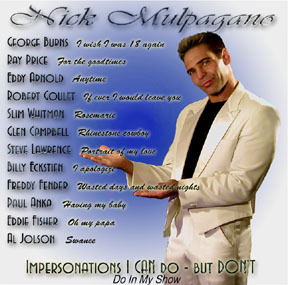 IMPERSONATIONS of some of my favorite singers! of ROD STEWART and CHER ....yeah- You heard me! 2-ROMANTIC themed songs in MY OWN VOICE-DONE!!! of all time in MY OWN VOICE-DONE!!!!! 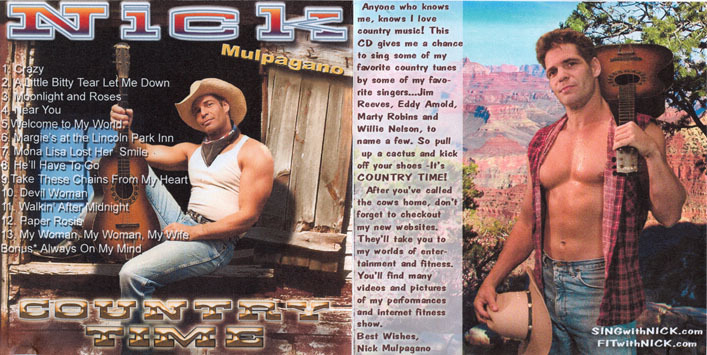 SING with NICK CD's, DVD's, T-shirts and more! Below- CD Recorded LIVE in the grand showroom of the Costa Atlantica cruise ship-Over 70 mins. of my LIVE SHOW! 10.00 FREE shipping! 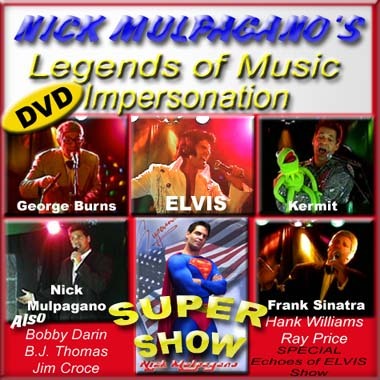 DVD -''SUPER SHOW'' - Filmed in a studio with many different camera angles and special effects.BONUS Echoes of Elvis Show performance from the NEW YORK State fair! FULL MOTION MENUES! Approx.. 90 mins 10.00 FREE shipping!. song in my own natural singing voice! 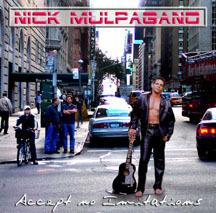 I have only very recently begun singing in my own voice, and from requests and encouragment from my fans,-I recorded this CD! SONGS- Someone Elses Star, Unanswered Prayers, Buy Me a Rose, I Love the Way You Love Me, And I Love You So, Somewhere Other Than the Night, Sonny Boy, I Swear, The Chair, Wind Beneath My Wings, Hero, When You Wish Upon a Star. 10.00 FREE shipping! CD-''ALWAY'' This is my 2nd CD of songs in my own voice. I've always want to record a collection of songs that would let you forget your problems and just let you kick back and relax. Let the the smooth vocals and lyrics take you to far away places, to the pyramids along the nile and somewhere over the rainbow. 10.00 FREE shipping!